The PR-ECO LED Mobile Lighting Tower is the new generation in LED Lighting Tower technology. The units utilise highly efficient LED lamps mounted atop an 8.5m vertical, hydraulic mast with a 48vDC extra low voltage lighting system for added environmental sustainability. 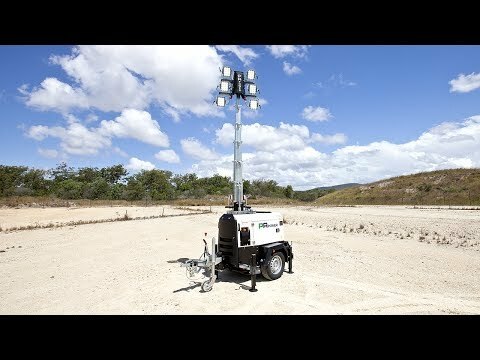 The PR-ECO LED Lighting tower is unmatched when it comes to Australian Road & Civil Works. It's small compact frame allows it to be easily transported via truck (up to 12 units per truck) and tow. Silent and fuel efficient consuming only 0.55 L/h. Its finally arrived in Australia after dominating the European market. The PR-ECO LED lighting tower is easy to operate and transport with road read compact trailer, central operating point, 350 degree mast rotation and 8.5m vertical hydraulic mast extension. The PR-ECO LED is available for sale & rental and supported by the PR Power branch network Australia wide.